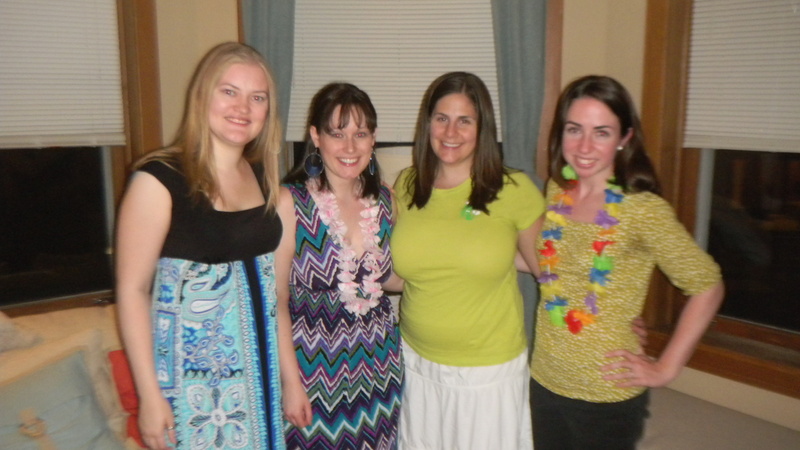 I hosted my annual luau last Thursday. The post title is apt in 2 ways. One, it was a last minute decision to have a luau this year (somehow, the summer got away from me and I almost forgot about it). Two, my blog website has been having issues since last week, and I have been unable to post since last Tuesday night. Finally, it seems to be working again. Back to the luau. To keep things easy, I set it on a Thursday evening, when my friends and I usually get together anyways. As it was low key, so are the party details. First of all, the scaled down party made it’s first appearance in attire. 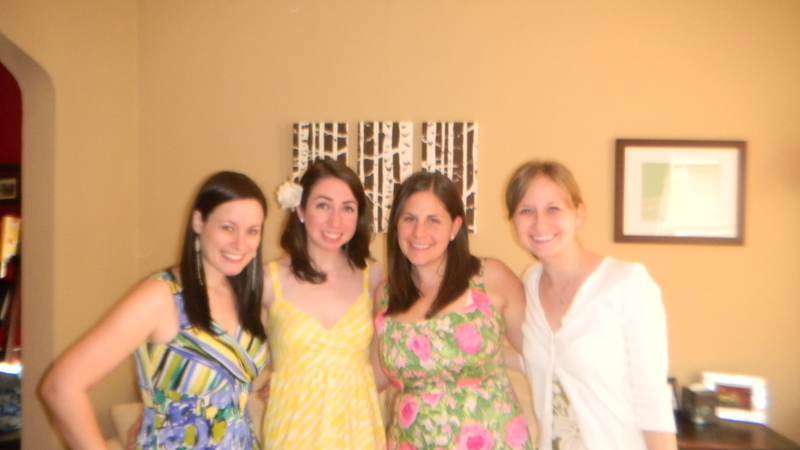 Last year, we wore sun dresses. For decoration, I re-used the paint chip bunting I made for my start of summer party with Dan’s family last year. To go along with that color scheme, I dug out some of the leftover paint chips from the bunting project. 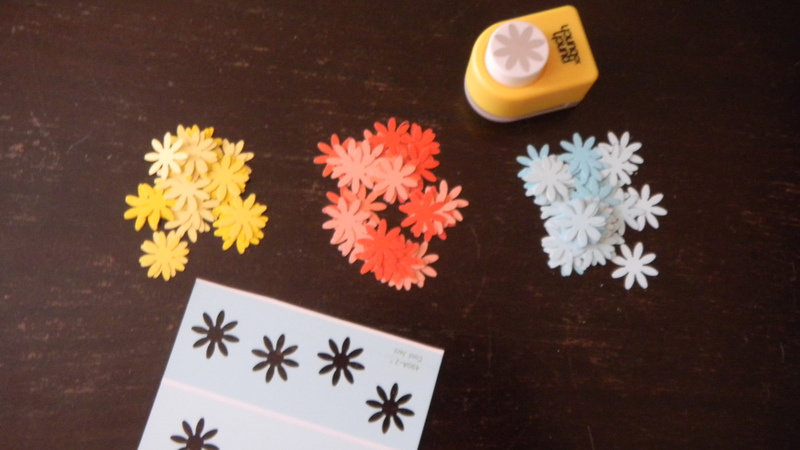 Using my trusty flower hole punch (also used for the wedding pomanders), I made a bunch of mini flowers. 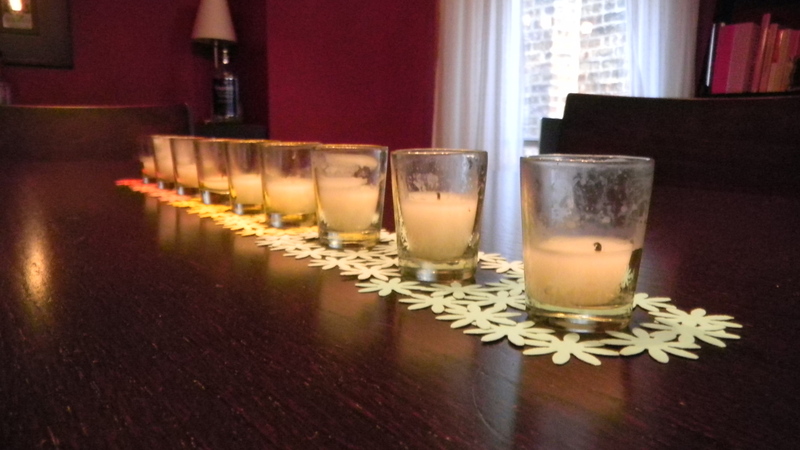 I decided to create an ombre-like effect for the table centerpiece using the flowers and some short white candles. 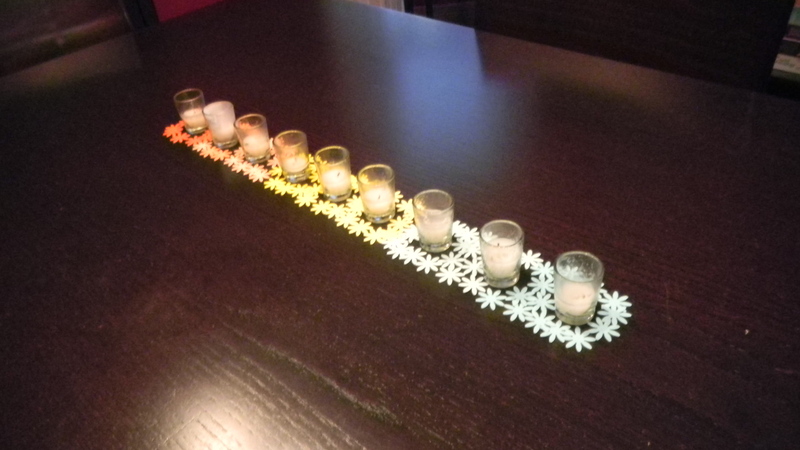 I originally thought about creating a whole table runner, but (1) punching out that many flowers would take a really long time, and (2) the table is pretty small, so keeping the centerpiece small seemed best. Still, I really like the way it turned out. For food, it was mostly potluck. Friends brought veggie/fruit trays, cheese and crackers, and homemade wine. I rounded it out with some fresh guacamole and chips and made coconut brownies for dessert. 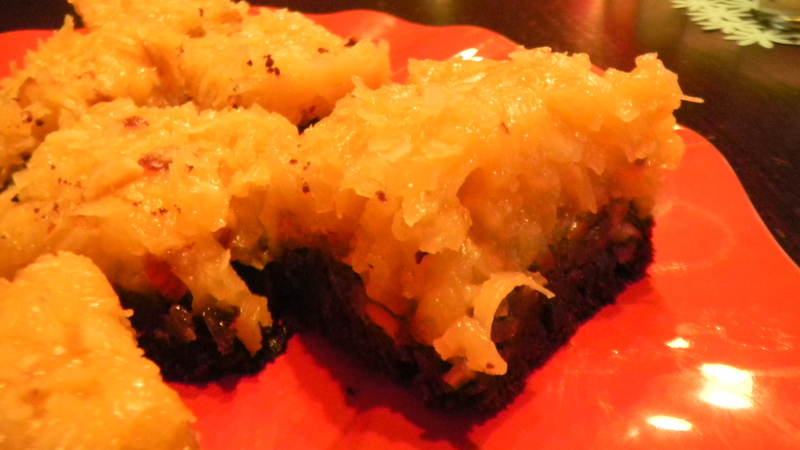 The coconut brownies are quite simple. I started with standard brownies made from a mix (don’t tell anyone). I did liven them up with some vanilla extract and extra baking chocolate, so I guess they’re semi-homemade. 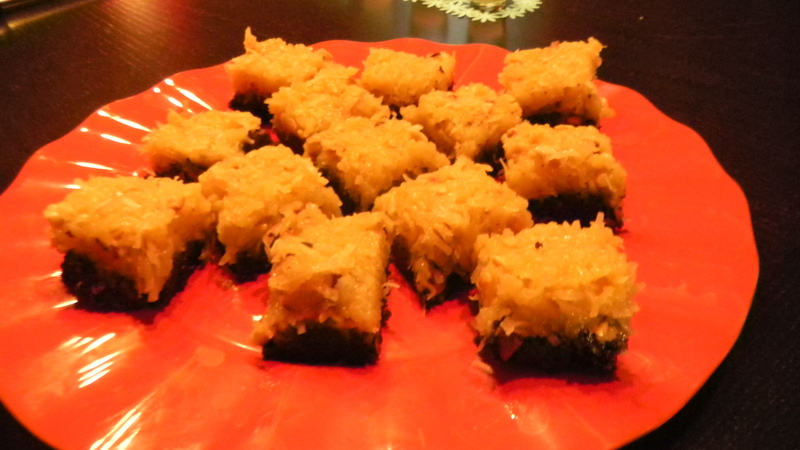 The thing that really made these guys delicious was the frosting (recipe is from here). 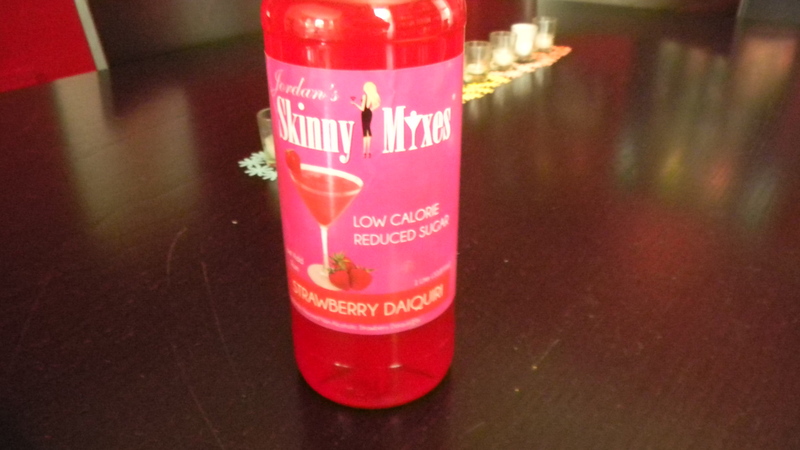 And finally, the drink of choice for the evening: skinny strawberry daquiris. I started out with a skinny mix (less sugar added) and some white whiskey. Yes, whiskey. It’s a fine substitute for white rum. Throw the alcohol, daiquiri mix, and ice in a blender and you have a delicious cocktail. And finally, here’s the obligatory group photo. Thanks for a fun night, ladies!